This year on July 28th, marks the centenary of the start of World War One, a conflict that claimed the lives of 8.5 million (c) servicemen and women worldwide. 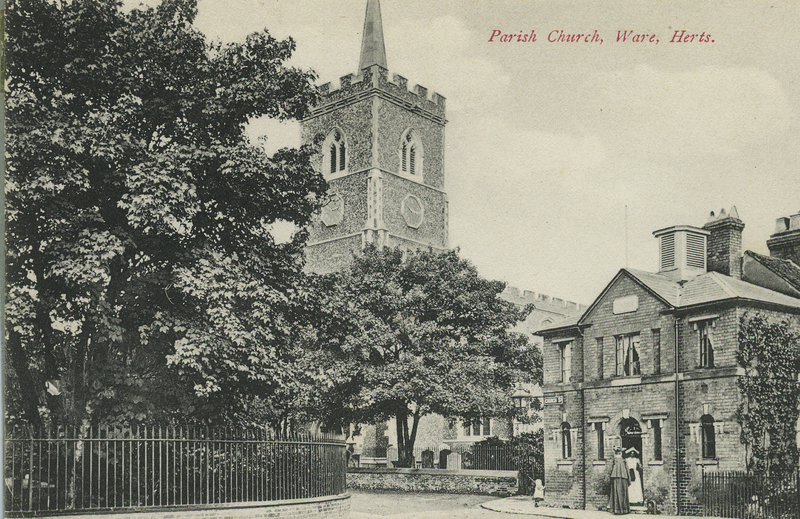 In total 650 men from the town of Ware went off to fight for their country, 220 of whom did not return; one third. In the small town, nearly every family lost a son, a brother, a father, a husband, a friend. The Cross of Sacrifice War Memorial in Ware was unveiled on a wet and windy Sunday, January 31st 1921, in front of a crowd of reportedly several thousand people. The crowd stretched along the High Street, Baldock Street, Church Street, spilled into Priory Street and West Street. People could be seen on the roofs of nearby buildings and watching from windows. 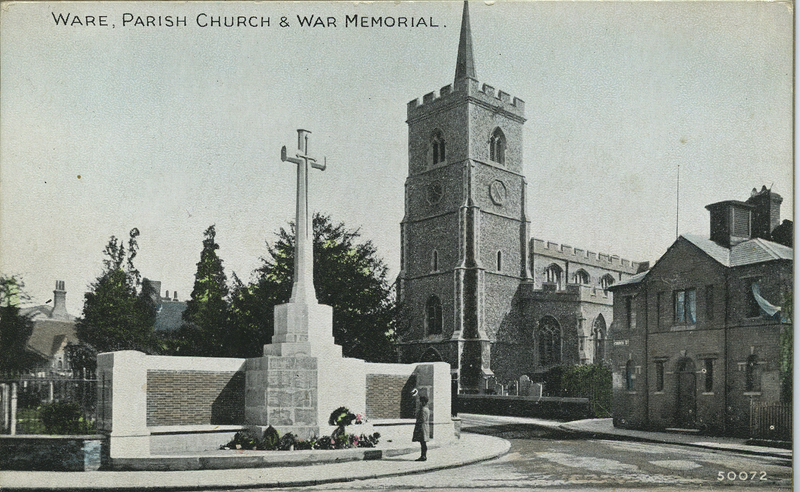 Before the memorial was unveiled around one thousand people attended a service in St Mary’s Church, conducted by vicar Canon Martin Reed, many of the congregation being the families of the fallen. Members of the newly formed Herts and Beds Regiment band played as the attendees sung hymns. A guard of honour was also present composed of the same regiment, the Hertfordshire territorial regiment that the majority of the Ware boys had been part of. At the ceremony, a 26ft Union Flag draped the memorial which was removed by the Lord Lieutenant of Hertfordshire, Viscount Hampden. After saluting the memorial, the Viscount Hampden who had served in France during the War began a tribute to ‘those gallant dead’. He spoke of a ‘spirit of comradeship’ and ‘unity’. After his tribute to all of those who served and died the amassed crowd sung ‘Revelle’ and ‘Fight the Good Fight’. As the ceremony ended, the assembly sung the National Anthem, while the Union Flag was raised up the tower of the Church. Relatives were finally invited to lay floral tributes to the fallen, as an open peal of the church bells sounded. 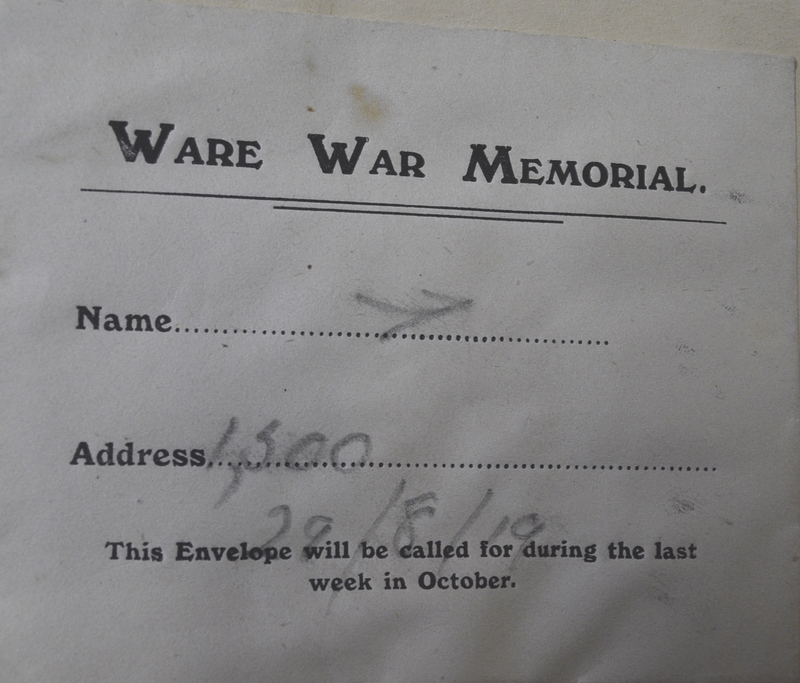 The memorial itself displays the names of 212 men who fought in the First World War. Some of the families decided against having the name of their loved one on the memorial, as they did not want a constant reminder of their sacrifice. · Mr Albany’s idea of a colony of housing and workshops with rooms for recreation for retired soldiers. · Mr A H Roger’s Free public library and rooms for recreation. · The Vicar’s memorial garden. Finally, it was suggested that a stone memorial be erected. The possible sites for such a memorial included: The memorial’s current site, Star Street, the Market Place, Henderson Corner, the Eagle and Rankin Square. In terms of design, the sub-committee chose to seek advice from Sir Reginald Blomfield, the British architect of the Menin Gate in Ypres, the memorial to 54,000 fallen soldiers who fought in the Ypres salient and whose graves are not known. 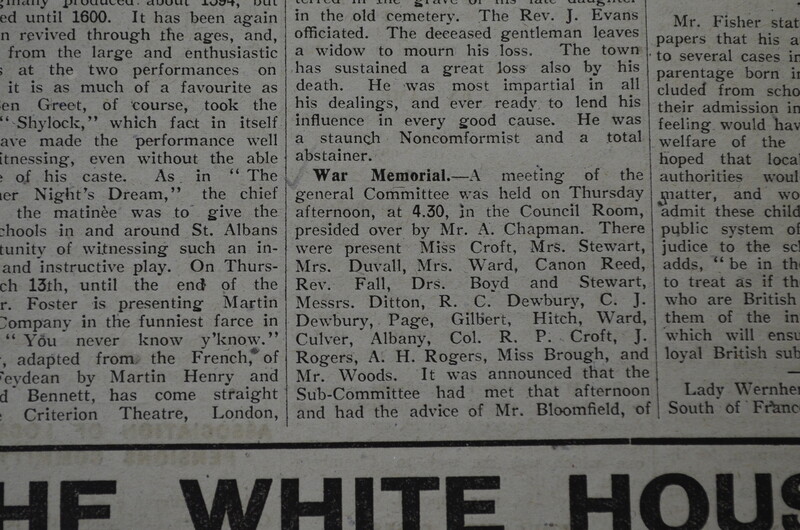 Blomfield was part of the War Graves Commission responsible for creating multiple memorials, after the war had ended. The architect recommended the site of the New Burial ground, the memorials’ current site. Blomfield suggested a memorial 22 foot high in a cross shape with a bronze sword set into the stone on the cross. The memorial would be accessible by three steps. The whole memorial would be created out of Portland stone and would cost a total of £1000. In today’s currency £1000 would be equal to nearly £42,000*. 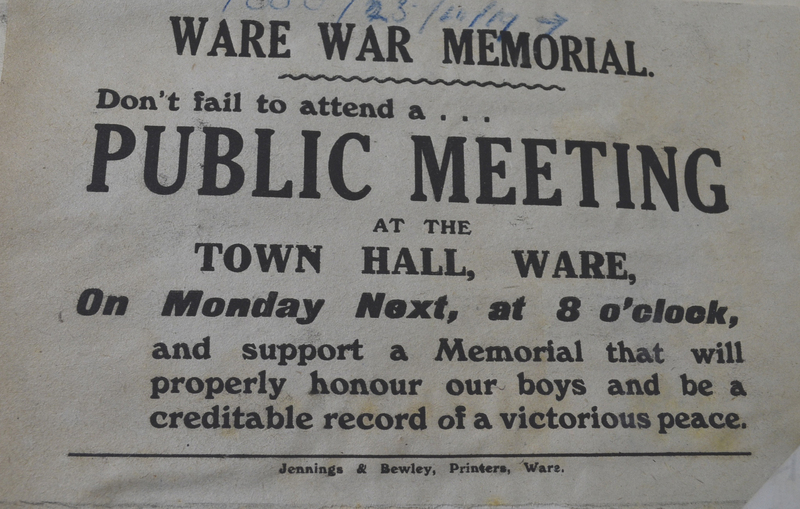 On the 28th April 1919 a public meeting was held in the Town Hall to discuss the various different suggestions. The committee suggested to the gathered assembly that site would be as aforementioned, the New Burial Ground. As the motion was proposed and seconded a Mr Kielf rose and said that he opposed spending such a large sum for public property to be put on private land. For some time, arguments over the nature and site of the memorial meant that arrangements came to a standstill. In which time, various private memorials and tributes were created. 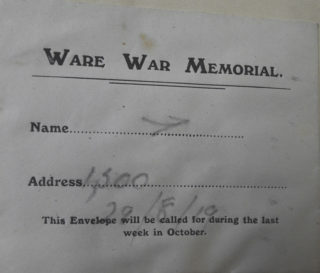 The Ware Scouts made a memorial which took the form of a roll of honour which was tied to the railings of the New Burial Ground where the town’s memorial stands to this day. A list of all of the men from the town was placed in St. Mary’s Church. Allen and Hanburys created a private memorial to 11 of the men who worked for the company and died during conflict. 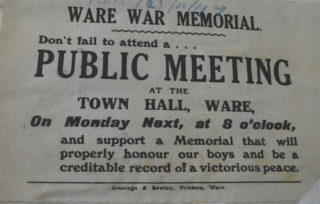 In June 1919 another public meeting took place to resolve the disagreements over the memorial. The committee still wanted the memorial to be situated on the corner of the New Burial Ground opposite to Yorke’s forge, which is where the Maltmaker statue and memorial garden stand today. A section of the town led by Kielf wanted the memorial to be erected where Yorke’s forge was situated. The meeting again came to no conclusion. The revelation that the land of the New Burial Ground was not in fact as the committee and Mr Kielf presumed to be owned by the Church changed the situation. The land was Ware Town property due to transactions which took place in the 1850’s. At a church meeting the Rev. 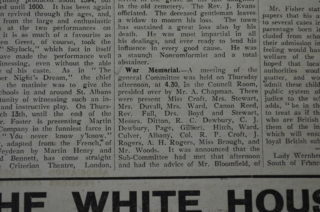 Canon Reed agreed to petition to the chancellor for a faculty to put up the memorial on the consecrated site. Permission was granted. Over the years, due to tree sap, bird droppings and general weathering the memorial has fallen into disrepair. 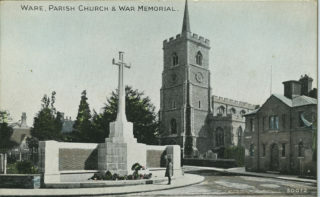 Restoration works were carried out in June 1999, but the memorial again needs work to restore it to a good condition. This year, restoration works are being completed once more. 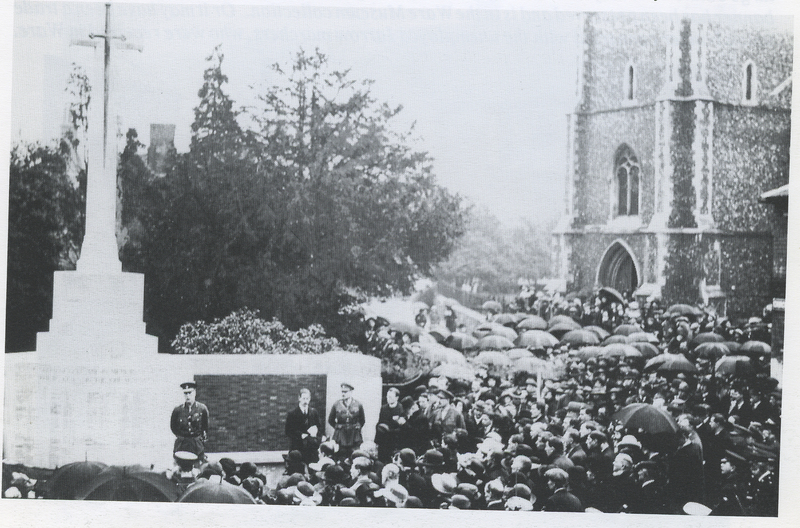 On the 22nd of June at 2:30 for there will be a short commemorative ceremony for the re-dedication of the memorial. This page was added on 07/03/2014.